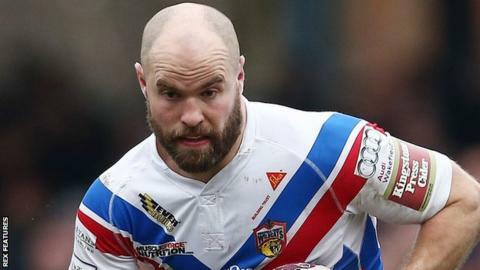 Wakefield reached the sixth round of the Challenge Cup with a comfortable win over Championship side Sheffield. Menzie Yere gave the visitors the lead, but Wakefield went ahead with two Liam Finn tries and one from Tom Johnstone. Yere reduced the deficit with his second try, before Ben Jones-Bishop, Tinrau Arona and Mickael Simon crossed to extend Wildcats' lead. Arona and Michael Sio added further tries after the break as Super League side Wakefield continued to dominate. Championship side Dewsbury Rams are also into the last 16 after beating League One club York City Knights 30-16. "We defended well in the second half, although they didn't ask too many questions, but I was disappointed that we were a little too lateral. "There was lots of effort from everybody but one of those games that never really got going - very stop, start with a lot of errors. "The main thing is that we got through to the next round." "We've been a bit soft recently and I asked for a response and to get the attitude right. "Both in the first 20 minutes and in the second half when we only let 12 points, was pleasing - so we fronted up. "We only had 10 sets in the first half so we didn't have many chances. But we had a dig and there is light at the end of the tunnel for us so hopefully we can build on that." Wakefield: Hall; Jones-Bishop, Gibson, Arundel, Johnstone; Miller, Finn; England, Howarth, Arona, Tupou, Ashurst, Sio. Replacements: Simon, Annakin, Yates, Walton. Sheffield: Laulu-Togagae; Worrincy, Yere, Tyson, Millar; Aston, Hewitt; Thorpe, Carlile, Stringer, James, Straugheir, Knowles. Replacements: Fozard, Minchella, Neal, Mexico.